First, let’s talk about what wealth is and what it means to be “wealthy”. Dictionary definition of wealth is – “an abundance of valuable possessions or money”. Dictionary definition of “abundance”- “is a very large quantity of something”. 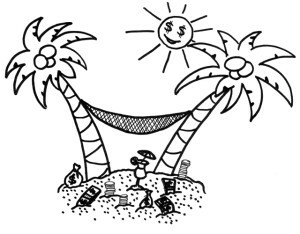 So putting the two together – wealth is a very large quantity of possessions or money. But just how much is a “large quantity” and in what context? Looking purely at income is insufficient in most cases. Case and point. Someone earning $25K may consider someone earnight $250K wealthy. Heck it’s 10 times as much as they make and seems completely out of reach. But that person earning $250K might not consider themselves wealthy (after taxes, mortgage, car payments, loan payments, day care, etc. ), however they may consider someone earning 500K wealthy, and so on. So is there a magic income? Is it 150K, 250K, 500K, 1M? For example, our government thinks that anyone earning over 400K (Individually) is wealthy and places that individual in a higher tax bracket. The point i’m trying to make here is that income alone doesn’t provide enough context. We need to look at other variables. Looking purely at money in the bank by itself also doesn’t draw the full picture. And once again we are faced with the “how much is wealthy” question. Is it 150K, 250K, 500K, 1M? Perhaps if we combine income and savings, then we’ll have a complete picture, and then we can put some numbers on it. But what would those number be? Is it $250K income / $500K savings, $500K/$1M, $1M/$10M? By this point most of you are probably thinking surely $1/$10M is definitely in the “wealthy” category. But what if I told you that the hypothetical person (let’s call him John Doe) is in this $1M/$10M club, however he is divorced and pays alimony to his ex-wife, he is paying off former business and personal debts, and his young new girlfriend has a taste for shiny things, lavish trips, and cosmetic surgery. Later on he also develops a gambling habit and a drug addiction. He loses his job, etc. etc. The point is – he is still working for his money, and he has huge expenses. And if his income stops coming, he will go through his savings in a blink of an eye. You get the point. Hopefully by this point i’ve convinced you that an abundance of money doesn’t always equate to wealth. The definition of wealth that I subscribe to is simple and doesn’t have specific amounts to chase after: wealth is financial freedom… period… end of sentence. (.) In other words, wealth gives you the freedom to not have to work to support your current lifestyle (yes, you may still choose to work because you love what you do, but the main takeaway is you don’t have to). Expenses: Money you spend maintaining your current lifestyle. This includes things like taxes, mortgage, car payments, insurance, utilities, food, childcare, etc. Investments (income producing): Investments that generate income such as dividends, interest, rent, etc. as stocks, precious metals, real estate, etc. Passive Income: Income for which you don’t have to work for directly (you know, exchange your time for money on an hourly basis sort of situation). This includes things like income derived from your investments such as: income from real estate, interest or dividends from stocks, sales of appreciated assets, royalty payments from a book, licensing intellectual property, etc. So now that we have those concepts defined, we can come back to that simple definition of wealth I mentioned earlier. 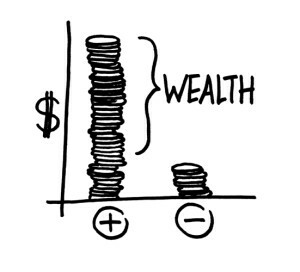 If wealth is financial freedom, or not needing to work for your money, then we can agree that wealth is achieved when your expenses amount to less money than the sum of your passive income. Talk about simple! Here is an example to further drive this home: Let’s say your monthly expenses add up to $5K, then according to this definition if your monthly passive income is $6K, then you are wealthy. Now, you might not be able to buy a Rolex, or a Ferrari, or a yacht right there and then, but that’s all temporary because you’ve figured it out, you’ve broken the code. You don’t have to work for your money, your money works for you! This creates a target that is easy to shoot for. It is within everyone’s grasp. Just keep striving to minimize your expenses while growing and diversifying your passive income streams. And when the two meet, you will have accomplished something 99% of people fail to do and you will be well on your way towards happiness, success, wealth.